Can. 188 A resignation made out of grave fear that is inflicted unjustly or out of malice, substantial error, or simony is invalid by the law itself. Can. 332§2. If it happens that the Roman Pontiff resigns his office, it is required for validity that the resignation is made freely and properly manifested but not that it is accepted by anyone. There are four protections here in these few words that essentially function as a legal fortress around the papacy to protect it from any attack – including, quite amazingly but not surprisingly, from the reigning Pope himself. Let’s go in order. The first clause: If it happens that the Roman Pontiff resigns his OFFICE…. Si contingat ut Romanus Pontifex MUNERI suo renuntiet…. Office. Muneri. We remember from all of our discussions and citations from the MOUNTAIN of papers and books written in the second half of the 20th century, centered around the German theologians such as Joseph Ratzinger, Walter Kasper, Karl Rahner and Hans Kung that these guys all positively AGONIZED over the distinction between the terms “Office” (munus) and “Ministry” or “Function” (ministerium). The Miller dissertation, which I’m sure you have by now bought and read, because, after all, why WOULDN’T you, especially if you have any direct interest in these matters? is basically a 300 page agony over the distinction between the terms “Office and “Ministry” or “Function”, and the difference between “ius divinum” and “ius humanum”, all with an eye toward the “fundamental transformation” of the papacy from what it is as instituted by Christ Himself, a monarchical juridical office, into a “collegial, synodal ministry”. If you look at the English version posted on the Vatican website, the translation is WRONG in that it translates “munus” as “ministry”. What we (a bilingual Italian and I) figured out is that the English version was translated not from the Latin directly, but from the Italian, which isn’t surprising at all. The people who work for the Vatican doing translations are NOT Latinists, but rather people who speak ITALIAN plus other languages, because Italian is now the operational language of the Vatican. So the Latin was translated into Italian, and then every other translation was done off the Italian. So, if the Italian version translated “munus” erroneously (with or without malice aforethought), then that error would seep into every other translation. And, what do we see? Sure enough, the two instances of “munus” in “Non solum propter” are indeed translated into the Italian as “ministero”, not “ufficio“, which would have been the correct translation. So, Houston, we have a problem. After reading the Miller dissertation AND the veritable mountain of texts from the Teutonic academy, much of it EDITED BY RATZINGER HIMSELF, it is 100% impossible that Pope Benedict Ratzinger DID NOT KNOW the precision between these terms, much less the profound significance and gravity of the two terms “munus” and “ministerium”. Furthermore, do we honestly believe that Pope Benedict did not, at any point, look at Canon Law with regards to Papal resignations, namely Canon 332.2? Of course he did. OF. COURSE. HE. DID. Quapropter bene conscius ponderis huius actus plena libertate declaro me ministerio Episcopi Romae…. Canon 332.2 specifically states that the Roman Pontiff, should he resign his OFFICE…. Canon 332.2 then goes on to say in that a Papal resignation must be PROPERLY MANIFESTED, which is pointing directly back at the opening clause. The Pope can’t resign the Petrine “ministry”, “function”, “position”, “job”, “title” or “post”. He has to resign the OFFICE – the whole shebang. And he has to “do it right”, hence “properly manifested”. This is the Papacy we are talking about, not a Johnny Paycheck song. But there is another aspect of Canon 332.2 that shoots down a LOT of false arguments with regards to this whole mess, AND warms my heart in that it demonstrates the providential hand of God in the writing of Canon Law, and what a spectacular human resource manager God is, and how much he loves the Papacy and His Holy Church. You realize what this clause does, don’t you? It completely protects the Papacy FROM THE MOB, and perhaps more specifically from THE COLLEGE OF CARDINALS ITSELF, and, as we have in this case, from the Pope himself should he be in Substantial Error. Again, just stop and think about this from a practical, common-sense perspective. Does it make any sense to you that there would be these laws written about the validity of a Papal resignation, but as long as a sufficient percentage of the College of Cardinals, or the people in general, accepted an illegal, invalid resignation, then… meh, it’s all good? If so, that would mean that the MOB, either in the sense of the College of Cardinals, or in the sense of the people themselves could WILL a pope’s deposition and the illegal installation of another man as “pope”. Take for example the Conclave of ARSH 1513 which elected Pope Leo X. At that time, there were only 31 Cardinals total, of which 25 attended the conclave. It wouldn’t have been too terribly difficult to execute a conspiracy to oust a Pope if all you needed were to get all or even most of a group that small on the same page, and that their will trumped the Law itself. Again, by the “popular acceptance” argument, the WILL of the mob would trump the Natural and Divine Law, and a coerced resignation would be validated by “universal and peaceful acceptance.” Or, a pope being bought off (simony) would be hunky-dorey, as long as everyone went along with it. And, as we are living right now and many people are arguing, a papal resignation made in SUBSTANTIAL ERROR would be totally fine and dandy, as long as everyone is cool with it including the very Pope who WAS HIMSELF IN SUBSTANTIAL ERROR, and an invalid conclave would be “sanated” and “validated” by nothing more than the will of the mob. And remember well that when we are talking about the Papacy, we are talking about a juridical office instituted by Christ Himself, AND GIVEN UNIQUE SUPERNATURAL PROTECTION. So, the will of the Mob can sever Jesus Christ’s supernatural connection to one man, and transfer it to another man IN VIOLATION OF THE LAW? Does that sound right to you? No, it is madness. It is CHAOS, and CHAOS is of satan. The only possible way a person could hold this position is if the SUPERNATURAL aspect of the Papacy were discarded (which sure seems to be the trend these days, especially in “Trad, Inc.”, make your generous donation to their tax-deductible 501(c)3 today!) You would have to deny either the words of Christ Almighty Himself in the Holy Gospels, or deny Our Blessed Lord and Savior’s Divinity in toto. As always, I hope this helps. Hang in there folks. The truth, and love of the Law will set us free! 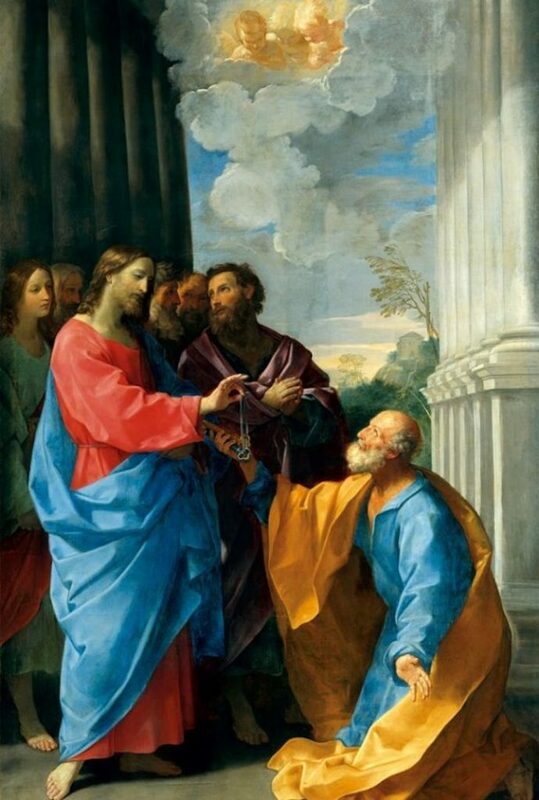 Christ Giving the Keys to St. Peter, Guido Reni, ARSH 1624. This entry was posted in Uncategorized on February 8, ARSH 2019 by Ann Barnhardt.